Before looking at specific activities for each of the two groups, we need to understand some general guidelines for working with children with cerebral palsy. 1. Impose your "talking face" in front of the baby in order to teach him "the vital skill of concentrating on one set of meaningful and associated stimuli, rather than vaguely scanning the world in general. In this way he learns to filter out confusing and irrelevant sensations and to pay attention to one problem at a time." 2. Play with the child in a way that is mutually pleasurable for both of you. "If the child is smiling and excited, he is playing and learning. Physical contact games (cuddling,.. . stroking, rubbing noses, kissing); visual games (approach and retreat of adult's face, movements of mouth, tongue, and head, hiding and reappearing); and vocal games (singing, gentle talking, lip and tongue noises, blowing and puffing air)" lead on to more active games such as clapping hands, wrestling, and rough-housing. 3. Always talk to the child. He should hear "the singsong rhythm of normal speech, and the flow of normal language." Avoid focusing on single words that he has to imitate. 5. If the child is to be helped to complete tasks on his own, you must gauge carefully how long to let him struggle and when it is appropriate to step in. "He must be shown the task, and then helped to go through the movements with his own hands or body.. . . After he begins to move with you.. . gradually withdraw your effort, particularly at the end of a sequence so that he completes the task by himself." 7. You must be patient with the slow-to-respond child. Even though he may be unable to respond quickly, he still may be quite able to understand. 8. You must persevere even if improvement is very slow. Often signs of progress will be very small. 9. You must learn to concentrate on helping the child now rather than worrying about the future. "What is needed is a determination to help him develop to the maximum of his capabilities:' not a preoccupation with whether he will ever approximate the normal. 12. You should encourage interest in the environment through peek-a-boo games and the hiding and finding of objects. 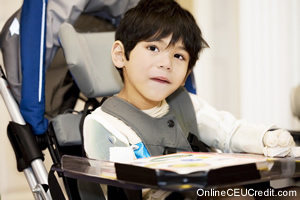 The preceding section contained information about treating children with cerebral palsy. Write three case study examples regarding how you might use the content of this section in your practice. Why should you imitate every noise a cerebral palsy child makes during play therapy? Record the letter of the correct answer the CEU Answer Booklet.